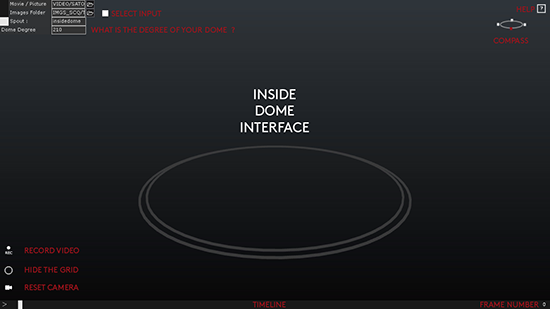 INSIDE DOME is a playback video for dome, you can choose the degree of your dome (0° to 360°) and let's create an azimuthal equidistant projection uv map. 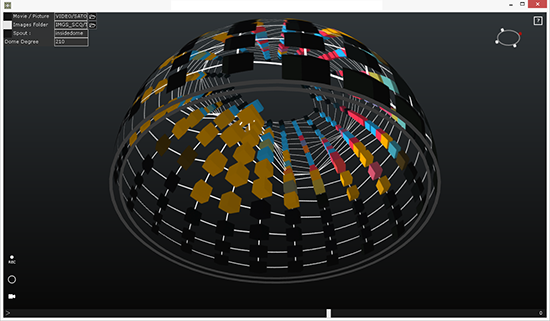 This appplication is usefull for fulldome theater, planetarium and any immersive dome-based video projection environnement. Observe your visuals on the dome, turn around with your mouse and record and HD video. by Fred Trétout, thank Francois Prenoveau for dome script. Free to use, free to share, free to thanks. Application + Videos files (210°). Last edited by anodin on Thu Feb 18, 2016 1:05 am, edited 1 time in total. Amazing, was about to start building something like this. Thank You! Hello, I'm new to touch designer. Can someone explain me how to use this to map something on a sphere? Just the basic workflow so I can understand how to route them all. I am familiar with nodal programming and other VJ software like isadora, resolume, vdmx, etc. I just don't know what to do with this project. Should I use syphon to route it in resolume, or how many projectors should I use and how where are my outs for them? Awesome. What about regular spherical or equirectangular videos. Will these also work? Of course, just change the Geo by a SOP Sphere and choose what you want in the Texture Coordinates parameter.